Apart from their use in engagement rings, diamonds are exceedingly sought after to embellish crowns and other royal jewellery. Everywhere in the world, the diamond is considered a thing of great beauty and value. However, some diamonds belong to a class of their own because they have not only exceeded the usual norms in terms of color, cut clarity, and carat; they have added two more C's: cost and celebrity status. It is not often that the earth releases large, gem-quality diamonds. In fact, less than half of the diamonds mined annually are good enough to use as gems. This means big, gem-quality diamonds are both rare and expensive. Diamonds that weigh more than 100 carats cost millions today, and except for the stones officially owned by royalty, a lot of secrecy surrounds the ownership of these gems. To date, the biggest gem-quality diamond that jewellers have ever known is the Cullinan. Found in 1905 in Premier Mine, Pretoria, South Africa, it was pried out of a piece of rock by Captain Frederick Wells, the mine's superintendent. 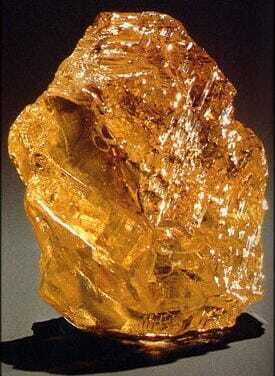 It weighed all of 3,106.75 carats and looked about the size of a block of butter. The diamond was presented in 1907 to King Edward VII of England for his birthday. All gems cut from this original unpolished crystal have been part of the official jewellery of the Royal Family. Nine major polished diamonds were produced from the Cullinan, named Cullinan I, II, III, and IV – and so on down the line. The biggest among these is the Cullinan I, also known as the Star of Africa. Weighing all of 530.4 carats (106.1 grams), it was fashioned as a pear shaped diamond and set in the head of the scepter of the monarch of England which was altered to accommodate the diamond. Cut by the firm of Messers I. J. Asscher of Amsterdam, the stone was set so that it could be worn by itself as a pendant, or as a brooch when combined with the 317.4 carat Cullinan II, also called the Second Star of Africa. 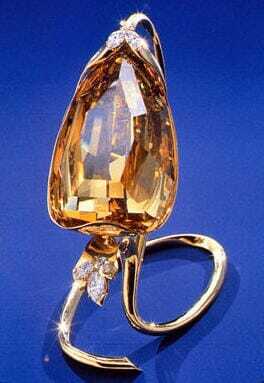 The Cullinan I was the largest faceted diamond in the world until 1985 when the Golden Jubilee was discovered. The Golden Jubilee was found in the same mine that the Cullinan came from. When Gabi Tolkowsky finished cutting it, the diamond was all of 545.67 carats. It was presented to the King of Thailand in 1997 for the 50th anniversary of his coronation. The Golden Jubilee was an extremely challenging diamond. 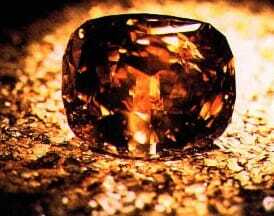 It weighed 755.5 carats and contained numerous imperfections that the master diamond cutter had to remove while putting in the 55-crown facets, 64 pavilion facets and 24 girdle facets that transformed the brown diamond into a golden work of art. It took Tolkowsky all of two years before he would be satisfied with his handiwork. A young girl playing just outside her uncle's home in Congo found this diamond in the ground. Uncut, it was all of 890 carats, but was chiseled down to 407.48 carats after master diamond cutter Marvin Samuels had sculpted it into a golden gem worth more than $20 million today. Like most extra-large diamonds, the surface of the Incomparable had numerous cavities, gaps and cracks. One of the most amazing features of this diamond is that it is not uniformly colored. Instead, the entire stone seems to have zones with colors ranging from light yellow to amber. It was officially presented to the public in 1984, during the diamond anniversary of Zale Corporation, a jewellery store chain with branches all over the USA. Some diamonds have become as famous as the Cullinan even if they are more modestly sized. These gems have become well known because of their mystique and the stories behind them. At 105.6 carats, the Kohinoor is modestly sized compared to the world's ten biggest diamonds. However, what it lacks in weight, it more than makes up for with its history. Written records of the Kohinoor date back to 1526. At one time, it graced the Peacock Throne of Shah Jahan who built the famous Taj Mahal Agra, India. The Kohinoor is believed to be cursed, bringing bad luck to the men who wear it. It seems however, that women are exempt from that curse. The stone was set in the crown of Queen Alexandra of England, who wore it for her coronation as Queen Consort of King Edward VII after it had been re-cut to its current size. Queen Mary and Queen Elizabeth have since worn it without mishap. The Kohinoor is part of the Royal Collection, which is housed in the Queen's Gallery in Buckingham Palace. The Taylor-Burton diamond is pear-shaped, internally flawless and all of 69.42 carats. Actor Richard Burton, who reportedly paid $1,100,000 for it, bought it in 1969. The diamond was his gift to Elizabeth Taylor who was his wife at that time. Later, when the famous couple divorced, Ms. Taylor auctioned off the diamond and got $5,000,000 for it. Proceeds are said to have been spent building a hospital in Botswana. The Taylor-Burton was not the first famous diamond that Burton bought for Taylor. He also bought the 33.19-carat Krupp diamond for her in 1968. On December 11, 2011, nine months after Ms. Taylor's death, it was sold for $8,818,500 – more than twenty times the $305,000 Burton paid for it. Jacqueline Kennedy received an emerald engagement ring from John Kennedy when she became his fiancée. This ring honored Kennedy's Irish ancestry; it featured a 2.8-carat emerald and a 2.8-carat diamond set in a unique crossover style. Jackie was rarely photographed wearing the ring, and she in fact had it redesigned. After the death of JFK, however, she had the ring changed back. After her death, the ring was sold for $1.5 million. The ring Onassis gave Jackie was a 40-carat-plus marquise diamond, which was later auctioned off by Sotheby's at $2.59 million. The diamond was part of the Lesotho, a diamond found in Lesotho, South Africa in 1967. 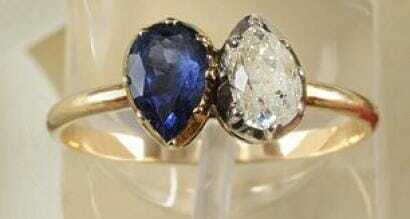 The ring Napoleon Bonaparte gave Josephine Fletches for an engagement ring in 1796 was auctioned off this year at the Osenat auction house in Fontainebleau for $948,000. If measured against celebrity standards today, this ring can be considered modest indeed. It has two pear shaped stones, a diamond and a blue sapphire, weighing a carat each. Because of the modest dimensions of the stones, the auction house was not expecting the ring to fetch such a generous sale when bidding was first opened. However, it seems that their clientele had decided that the ring's history made it worth quite a lot more than Osenot's appraisal. Ben Affleck and Jennifer Lopez were an engaged couple once, and she had a beautiful 6.1-carat pink diamond ring from Harry Winston to show for it. The ring was allegedly worth $1.2 million and if price were a guarantee for happy endings, they would have lived happily ever after. Unfortunately, things didn't work out well. They both moved on to other engagement rings and married other people. Jennifer Lopez married Marc Anthony who gave her a $4 million engagement ring, while Affleck found a new Jennifer whom he gifted with another Harry Winston ring. Beyonce's 20-carat engagement ring was an announcement in itself. All of 20 carats, the Lorraine Schwartz ring set the hopeful Jay-Z back by $5 million, and sent out the unmistakable message that he and Beyonce were a couple. It cost Kris Humphries $2 million to keep the tradition of giving an engagement ring when you plan to marry. The Lorraine Schwartz creation stayed on Kim's finger for an incredibly short time, even by Hollywood standards since the marriage lasted only for 72 days. Because of this, Kris felt entitled to keep the ring and arrange for the auction of the 16.2-carat ring at Christie's. When Paris Latsis asked Paris Hilton to be his wife, he did it with a 24 carat diamond ring. Each carat of the bling was supposed to represent a year in the life of the socialite –turned-actress who later complained the ring was simply too heavy to wear daily. Now, what do you get when you have two people named Paris getting engaged? You get two engagement rings. Paris L. came up with a diamond band for Paris H. to wear daily. Unfortunately, not even two engagement rings could keep the couple together. Four months after they got engaged, the two Parises went their own separate ways. All the stories about diamonds show that this gem has fascinated people for centuries. However, a closer look at the lives of people who have had the privilege of owning the best diamond engagement rings will show that it takes more than a diamond to make relationships work. Indeed, story after story will show that happily-ever-after depends not on the engagement ring but on the strength of the promise the ring stands for.